Quite simply the finest coated cleaning rods available, PERIOD! 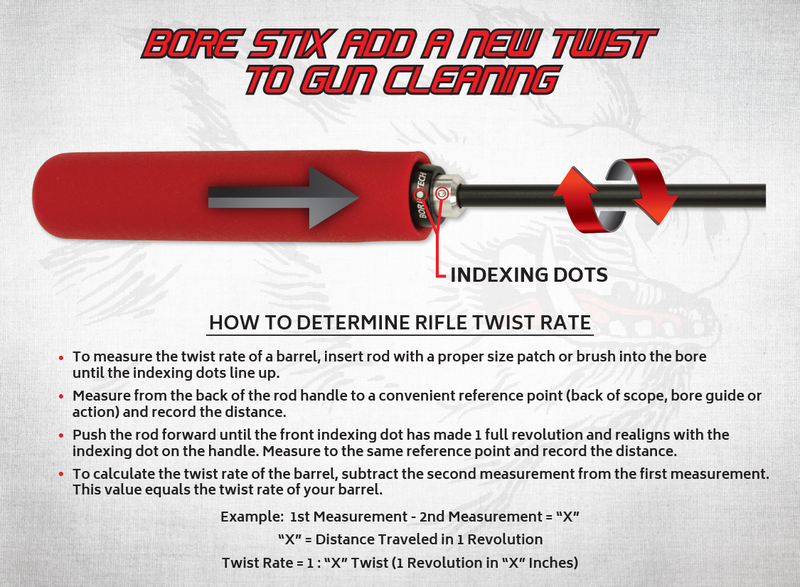 Featuring industry-leading ball bearing handles, proprietary, non-brass, Proof-Positive tips, color-coded caliber specific handles and an extremely durable coating our Proof-Positive Bore Stix™ set the bar in cleaning rod technology. Choose the best… Choose the Bore Tech Proof-Positive Bore Stix. --- Select --- BORE STIX, 7 MM - .30 CAL 25" BORE STIX, 7 MM - .30 CAL 30" BORE STIX, 7 MM - .30 CAL 36" BORE STIX, 7 MM - .30 CAL 40" BORE STIX, 7 MM - .30 CAL 44" BORE STIX, 7 MM - .30 CAL 48" BORE STIX, 7 MM - .30 CAL 52" BORE STIX, 7 MM - .30 CAL 56" BORE STIX, 7 MM - .30 CAL 60"
Bore Tech’s Proof-Positive Bore Stix™ are quite simply the finest coated cleaning rods available, PERIOD! Featuring industry renowned ball bearing handles combined with cutting-edge Proof-Positive materials, these rods set the bar in cleaning rod technology. The free floating, dual bearing handle design allows for effortless motion and precise following of the barrel’s rifling. Translation: Proof-Positive Bore Stix provide effective cleaning and eliminate the frustrating issue of having jags and brushes unscrew from the end of the rod. In addition, the color-coded handles offer a comfortable, non slip rubber grip that prevents damage to the rifle stock and eliminates the guesswork in determining what rod to use for what caliber. All rod lengths listed are the “Working Length” of the rod. These measurements DO NOT include the length of the handle. For rod overall length (OAL), add 5.5” to the rod’s Working Length. See figure below. 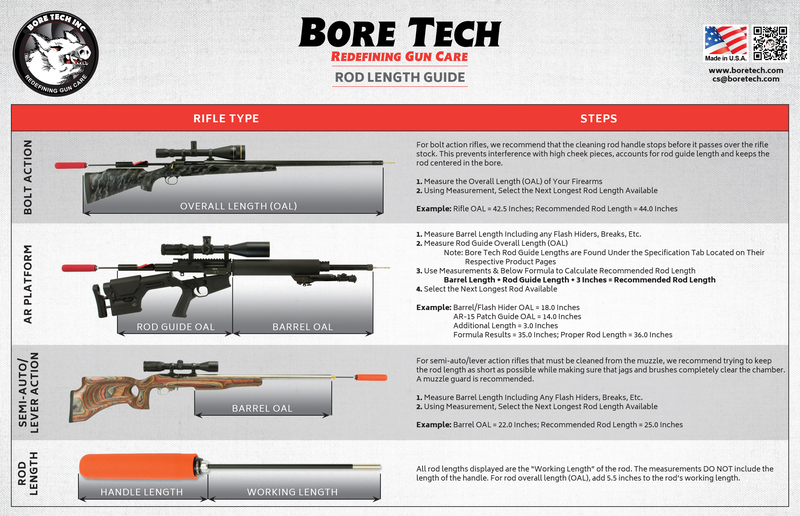 Use of A Bore Tech Bore Guide or Patch Guide™ Is Strongly Recommended To Protect Your Proof-Positive Bore Stix™ and Firearm. Q: Does the mentioned length include the handle? A: No, the specified length is the “Working Length” of the rod and does not include the additional length of the handle. See illustration in Specifications Tab. Q: What are the diameters of the rods? A: The diameters for the different caliber rods are listed in the Specifications Tab. Q: Are the rod tips male or female and what are the threads? A: All rod tips are female and have either 5/40 or 8/32 threads. The corresponding threads are listed in the Specifications Tab. Q: What are the handle colors of the Bore Stix? A: The handle colors are used to clearly identify what caliber(s) the Bore Stix are to be used with. The corresponding caliber/handle color chart is displayed in the Specifications Tab. 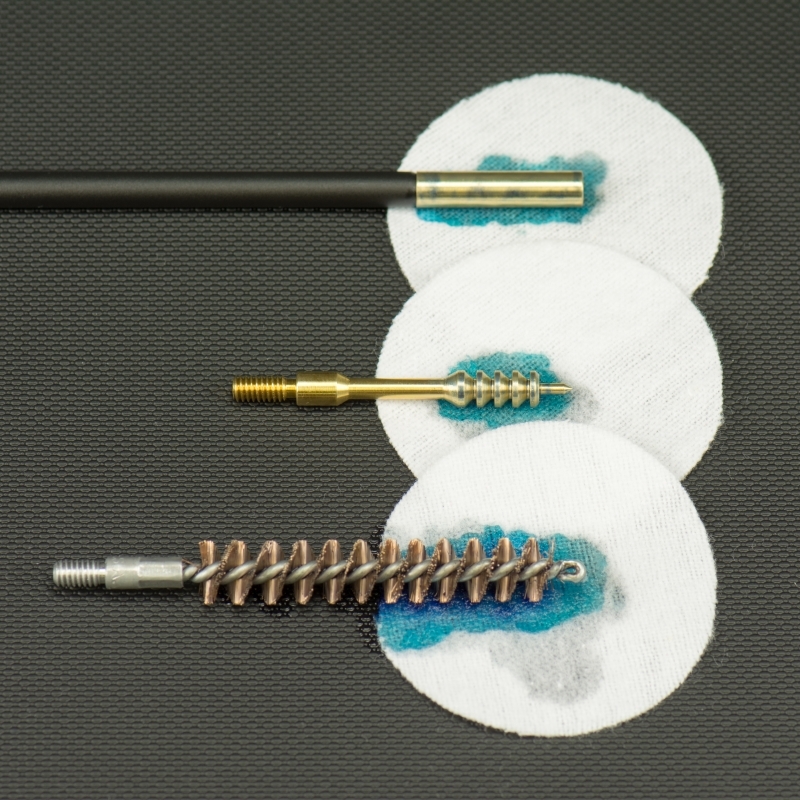 Q: What is the difference between the Proof-Positive Bore Stix and V-Stix? A: The Proof- Positive Bore Stix are our top-of-the-line premium coated cleaning rods and feature the industry renowned color coded, comfort grip, ball bearing handles, exclusive Proof-Positive tips and a vast variety of diameter and length choices. The V-Stix are a great coated cleaning rod for the money. They feature color coded, rotating hard plastic handles, brass tips and fewer length and diameter options. Q: What is the difference between the 22 Rimfire and 22 Centerfire rods and can I use my Rimfire rod on my Centerfire rifle? A: The 22 RF rod is approximately 0.015” smaller in diameter to help clear ejectors and choked barrels frequently found in rimfire rifles. Yes, you can use the 22 RF rod on a 22 CF rifle without any issues. Do not use 22 Centerfire rods in Rimfire rifles. Q: How do I clean my rod once finished cleaning my rifle? 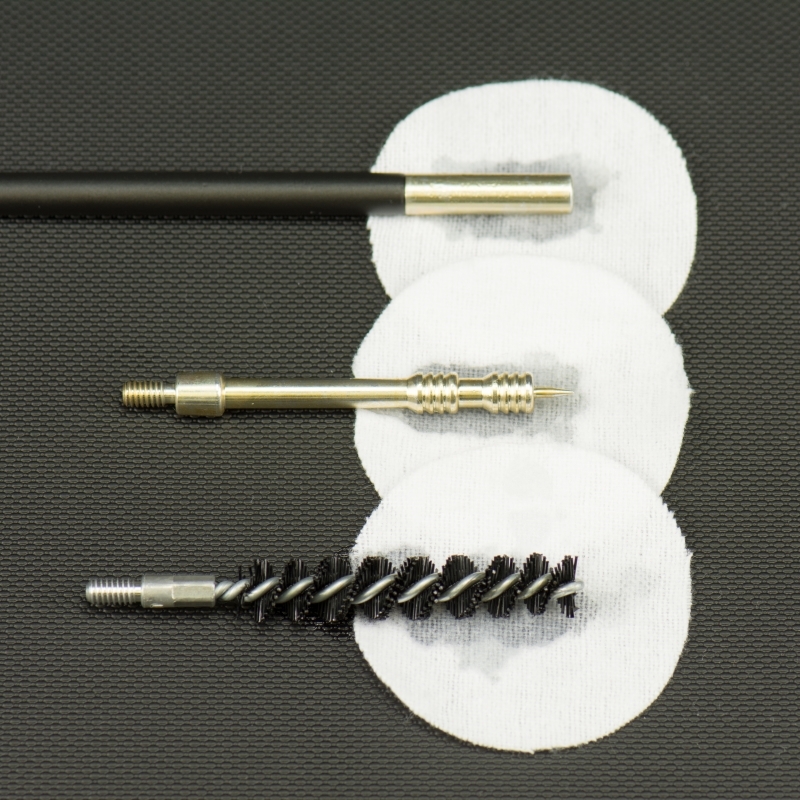 A: When using Bore Tech cleaners, simply wipe down the rod with a damp rag or paper towel. The Proof Positive rod is the Rolls Royce of cleaning rods. It has the best coating, the best handle and the best bearings. The alloy tip is just a plus!!! I received my Bore Stix cleaning rod today and I must say, I am very, very pleased. It's far superior to the Dewey rod it replaces and I just wanted to thank you for producing such a great product. I'll be ordering more of your stuff soon.I am a very satisfied customer. I just bought one of your 40"" .20 caliber Bore Stix and I am about to purchase your new jags and brushes. It's about time that a manufacturer addressed this obvious false blue reading issue, thank you.